World Penguin Day signifies the annual (and relatively slow) northward migration of penguins. This happens each year on or around April 25th. So, some time around this date is a good time to engage in this lesson plan. Using a sensory poem as a teaching device—and a bit of costuming just for fun, help your students enter the world of a penguin. In advance of the day of the lesson, instruct all to arrive dressed in only black and white (it needn’t be a tuxedo but, hey, no further restrictions in this department add to the fun). Hang images of penguins around the room and/or bring to class a documentary that shows the penguins in their natural habitat (Antarctica, South Africa, New Zealand or Australia). Make sure to show students where these places are on the globe or a map. Penguins, while they are in fact birds, do not fly, in part due to their robust skeletons. Instead, they walk or waddle their way to and fro. There are 17-20 different species of penguins. Most penguins live in a cold climate, such as Antarctica. Penguin diets consist mainly of fish, cephalopods (octopus, squid, etc.) and crustaceans (e.g., shrimp). Sometimes, small stones are swallowed as well to aid in digestion. Although on land, they appear awkward and unwieldy, in the water, penguins are very graceful. Penguins use their wings as humans might paddles for a canoe; this helps them to swim. 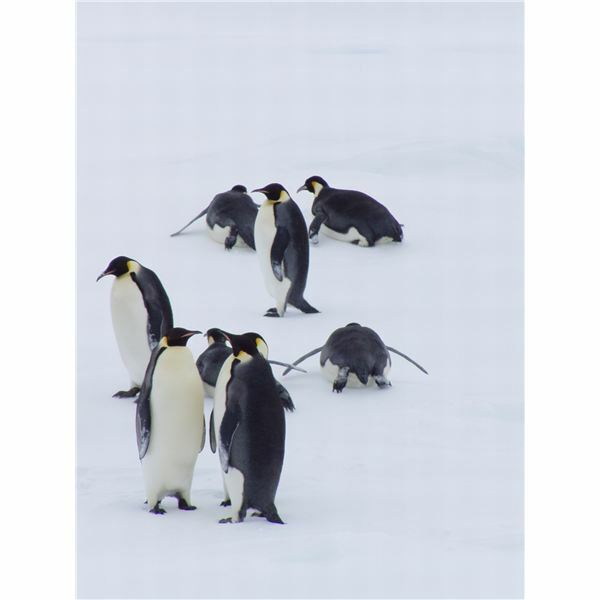 Most penguins live in a group called a colony (or rookery). Penguins’ feathers are coated with oil, making them waterproof. After the female penguin lays an egg, the male incubates it between his feet for 4 months while the mother hunts for food. 1) Because most penguins live in a cold climate, turn on a fan and allow the classroom to become a little chilly. 2) If there is a water fountain nearby, have each student take a drink. (NOTE: you may also provide water for them by way of paper cups). 3) Then, ask students to close their eyes and meditate on the information provided them for about 60 seconds considering the following questions: How would it feel to be a penguin? What kind of mood would you be in most often? What goes on in a typical day? 4) When that time is up, instruct students to write a sensory poem about what it would be like to be a bird that moves by waddling, not flying and one that lives in an often cold and wet environment. Remind them that such a poem would focus on the five senses: hearing, feeling, smelling, seeing, tasting. 5) After 10-12 minutes, begin asking students to come up and read their poems. As a class, discuss the imagery and palpability of the penguin experience provided by the shared poems. Talk about this in conjunction with a review of what all was learned about this special bird.